How do I connect the MacBook (USB-C) to the 30" screen with 2560 resolution? Sorry for the German pages but I am sure you can find it also in other countries' stores. Connect that combination and also don't forget to connect the active converters power through USB. If it starts with a scaled resolution, don't worry, there is a key combination (option or command scaled resolution) and you get the highest one. Works like a charm! I know it's pricey but I love my 30" Cinema Display. I also got my old MOTU Firewire audio interface with apples TB3 to T2 and then TB2 to FW and an additional FW cable from Belkin to run. "The USB-C to DVI adapter will not work with Apple Cinema Displays or the Dell 3007WFP. These monitors require a true DVI-D signal. Please note this before purchasing"
After weeks of trial and error, I have finally achieved 2560x1600 resolution on my Apple 30-inch Cinema Display connected to my MacBook Pro,15-inch, 2016 laptop. The trick is to go from USB-C to Mini Display Port (MDP), then to dual-link DVI. Unfortunately, this does take two adapters, but at least the full monitor's resolution is supported. Also to note, the DVI adapter needs to be powered by the attached USB connector, and the monitor break out cable USB also needs to be attached to the MacBook. A bit of a cabling challenge, but everything is now working 100%. Andreas came up with a substantially similar solution, but with different brands and gets the answer bonus! It works, but only up to 1280 x 800. You'll need a USB-C to DVI adapter to connect the 30" Apple Cinema Display to your USB-C Macbook. This $22 one, by Cable Matters, supports resolutions of up to 2560x1600 (the same as your monitor) and works with Thunderbolt 3 and the new 2016 MBP. I'm sure a commenter will be quick to point out that it's not a dual-link DVI adapter, but it doesn't have to be: it allows all 2560x1600 resolution through its single link (well enough, in fact, to trick most reviewers into thinking it's dual-link). It will still push 2K resolution to your Cinema Display. 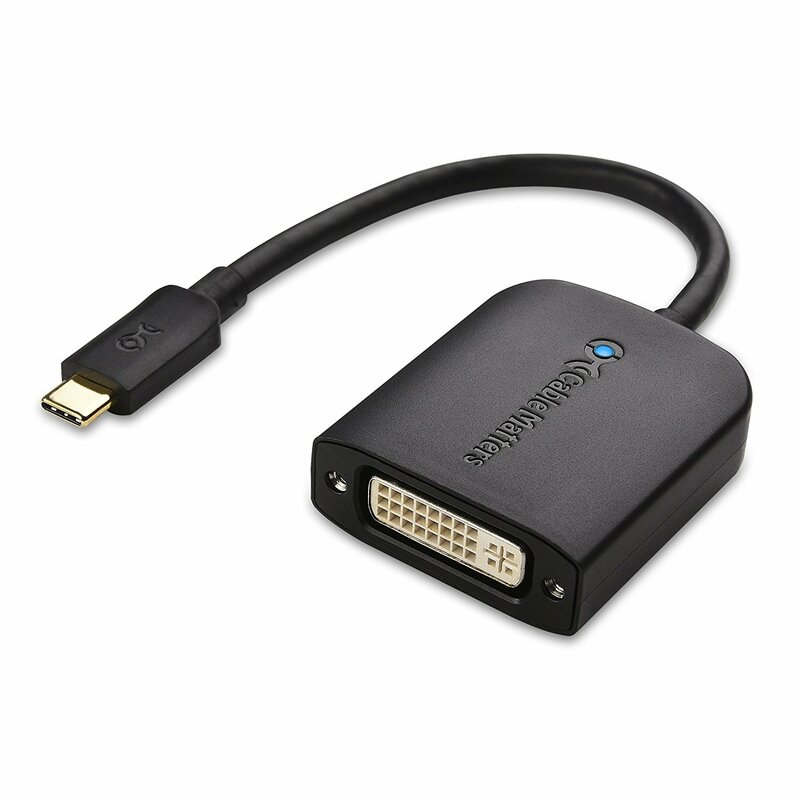 Edit: If you don't have a DVI-to-DVI cable (which you'll need to connect the monitor to the adapter), I recommend this gold-plated one. Note: This is not dual link DVI and will not support the full resolution of an Apple 30” display. Note that the Apple Thunderbolt 3 (USB-C) to Thunderbolt 2 Adapter will NOT work with 30" Cinema Display, once that signal has been converted to Mini DisplayPort. Note that although it uses a Mini DisplayPort connector, the Thunderbolt 3 (USB-C) to Thunderbolt 2 Adapter doesn’t support connections to Mini DisplayPort displays. On the link it says that it should work with the new USB-C MacBook. Not the answer you're looking for? Browse other questions tagged macbook usb cinema-display dvi . What technical requirements need to be satisfied by a DVI KVM for these two Macs? MacBook 2017 (USB-C) to Apple Cinema Display 30"